What is the Infection Monkey? The Infection Monkey is a cyber security testing tool, capable of wandering around the deepest parts of the data center. It will spin up an infected virtual machine inside random parts of your data center, to test for potential security failures. It behaves more like a random hacker than a vulnerability scanner. The Monkey attempts to move around the data center by leveraging different lateral movement methods typical of a real attacker who has already compromised an internal system. When it successfully reaches another machine, it means that there’s a security failure that should be fixed. The Infection Monkey’s high level operation is simple. It is designed to scan the network, check for open ports and fingerprint machines using multiple network protocols. After detecting accessible machines, it attempts to attack every single machine using a variety of methods including intelligent password guessing and basic exploits. Infection Monkey is a work in progress and we have ways to go to fully realize its benefits. The Monkey’s actions are designed to be completely safe for use in a production network. The amount of network traffic generated is very small and all the exploits used were written to prevent any damage to the target or attacker. After all, you do not really want to take your data center down. Do you? Here’s a glimpse of what running the Infection Monkey in an unsecured network looks like [Figure 1]. 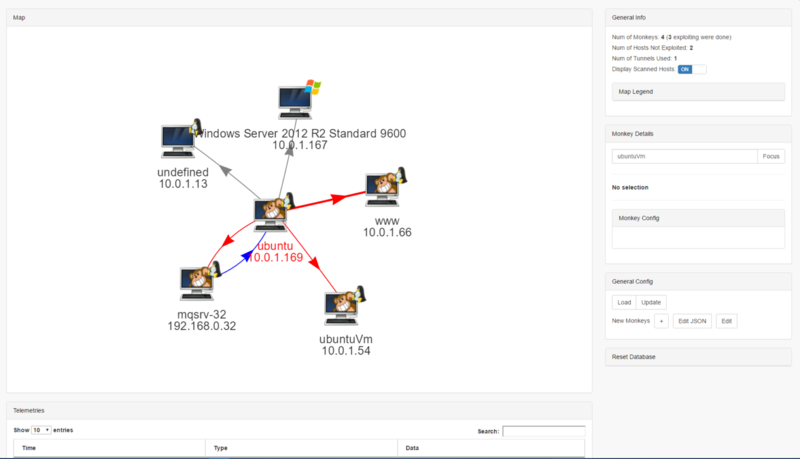 Its command and control UI visualizes its spreading path and what you get is a ’spreading graph’ that demonstrates the effect vulnerable segments have on your entire network. Setting up the Monkey in a live environment is simple, fun and safe. We describe here the entire installation process on a clean Ubuntu 16.04 server distribution. 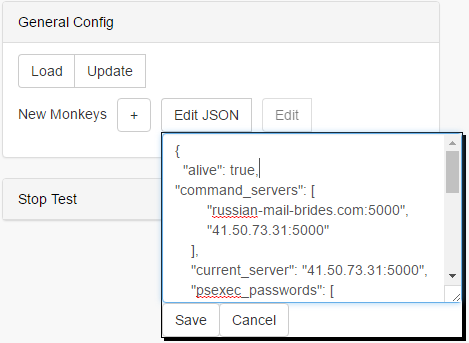 The command_servers parameter must be modified to specify the Monkey Island server address (including port). Setting local_network_scan to false will prevent the Monkey from scanning any local interfaces. To attack specific IPs, set the the range_class variable to “FixedRange” and specify in range_fixed the exact IPs you want attacked (for example, “192.168.1.45”,”weakServer.domain.local”). Now copy the modified fields into the Monkey Island’s configuration window (not in this particular order). Important Note: Click Update to update the configuration on the server. With the Monkey Island as the initial attacker. This will use the Monkey Island server as a starting position for the Monkey, from which it will expand based on the configuration. Running the Monkey from a machine elsewhere network. Execute the Monkey from the console, passing the server address as a parameter and the magic keyword for execution. Once executed, the Monkey will instantly start working while the C&C server will allow you to track its progress. If you want to end the Monkey’s infection, Set the Allow running button to OFF. How Do I Get the Infection Monkey? Download the Infection Monkey as a precompiled binary and a compatible C&C server from our website at www.infectionmonkey.com. Then, following the included README you can quickly begin running it in any environment. Alternatively, you can download the source code from the GitHub repository and compile it yourself using the provided documentation. The Monkey is developed on GitHub under the GPLv3 license. Contributions are welcome! We invite you to join our Infection Monkey project, contribute code and open issues and feature requests.